Repetitious Cutting Of . . . Constructed of high-grade cast iron, precision machined. This is a direct drive motor to gear box, coupled via 2 piece coupler with a high resistance rubber pad between. This design generates optimum performance in a noise-free atmosphere. Maintenance free. 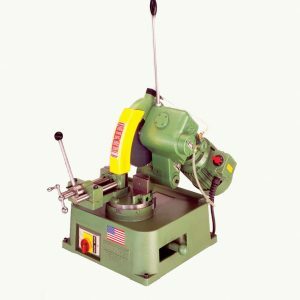 Designed with safety and rigidity in mind there 2 piece inner and outer guards work as a shields to fully cover the sawblade and protect operator in any position of the head from accidental contact with sawblade. Seal-less electric coolant pump is mounted on top of of removable large capacity coolant tank. Tank located in base of machine. Coupled with detachable hose to the coolant nozzle, based on top of inner guard. Flow is easily controlled by valve. Controlled and protected with switch, which gives user the convenience of turning the coolant system on-off and thermally protecting it at the same time. 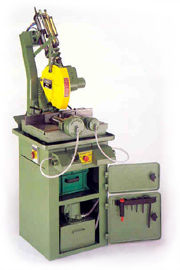 All Doringer machines are driven by AC constant torque motors. 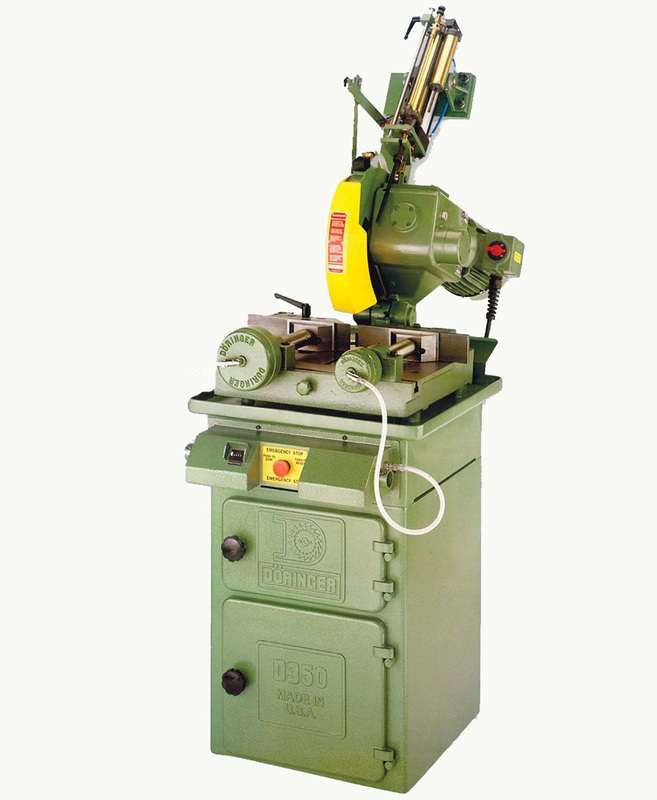 Every motor is protected with overload protection switch, set for your particular machine. The speeds shown above are motor speeds only, and are further reduced in ratio 1:31 which is the actual sawblade speed. Please specify voltage: 220v. 3ph or 440v. 3ph. Constructed of cast iron class 40, used in the industry for precision parts and high resistance to wear, machined to tolerances not to exceed ±0.001″. 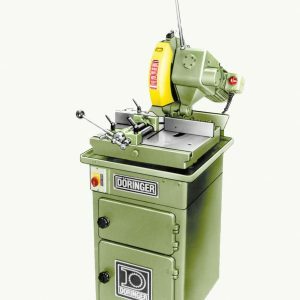 The flat base with scale conveniently marked on top also incorporates the turn table, which turns left and right for mitering purposes, without turning the workpiece. Two Separate air cylinders are used to clamp material on place. Each individually adjustable for depth and air pressure. Total clamping power 8,000 pounds, if used with 100psi. Each cylinder could be easily moved left or right, allowing sawblade to finish the cut. Total movement forward of cylinder, when actuated is 0.250″, which insures safety. Hydro-pneumatically controlled, with adjustable rapid movement downwards and return. Cutting cycle is totally controlled via bellows hydrocheck. As a safety feature, unit will not operate if electrical power is disconnected. In upper rest position motor shuts itself off. Ergonomically set for good visibility and safety. Unit must be 2 hand operated. Panic button is latching type and safety colored. 350mm (14″) maximum size suitable. Special applications might require smaller sawblades. All products are warranted to conform to the manufacturer’s general standards of quality of materials and workmanship. 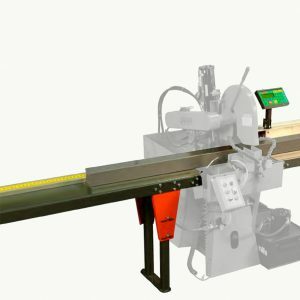 Any parts not meeting with standards will be supplied at no cost to the purchases up to 12 months after delivery date and will be fitted on return of the machine to the company’s factory. Parts deemed by the manufacturer to have failed through normal wear and tear, misuse or abuse are not covered by this warranty, even if failure occurs during the 12 month warranty period. Sawblades and other perishable tooling are not covered by warranty.